The garden has become a sore point after a succession of gardeners who apparently couldn’t understand my simple gardening requests. Examples include: me stating, ‘Please don’t prune that plant’ which was translated into, ‘I dug it up’, along with my request ‘I would like a higgledy patio’ which translated into ‘I have dug a pond big enough for your boat’, alongside my reflection ‘I would like the border to slope upwards towards the fence and away from the lawn edge’ which translated into ‘I have levelled your borders with the lawn, so the lawn now has no edge whatsoever’. I have become increasing exasperated and after a particularly bad day at work I attacked the garden with a spade. This warlike charge resulted in a trip to Corby urgent care, a sack of diazepam and prescription strength codeine plus a large slug of gin and binge watching Peaky Blinders to relieve the pain. Poor old Monte also suffered as I couldn’t reach the floor to put his food down, so had to call in my other neighbour to feed the mighty Monte. I truly believed that this was going to be a long term injury, and had images of signing up for mobility aids including a high, padded, toilet seat.After all given the large quantity of prescribed drugs the only conclusion was the Doctor saw this as being long term! It was then nothing short of a miracle that a week later I could walk without a stick, and drive. As a result, I was able to make it to Crick to the annual boat show. 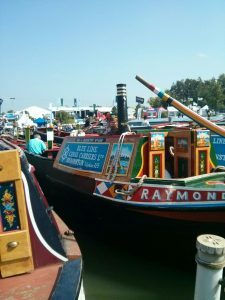 Crick is the largest inland waterways boat show in the country and was previously held at the narrowboat Makkah of Braunston. 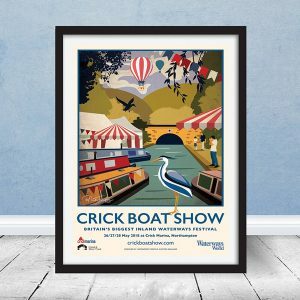 Like so much of the waterway’s calendar I had no knowledge of events at Crick only 20ish minutes from my house in Northants until I acquired a boat in 2016. 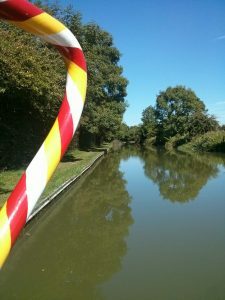 Perhaps counter-intuitively I drive to Crick, rather than taking the boat. 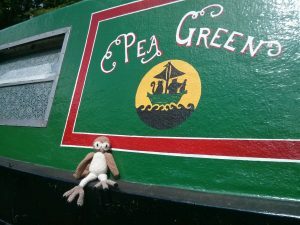 My slow travel on the Grand Union would mean the journey taking at least two days to travel from Welford, and another two to get back, largely because it’s rude not to moor up for a night at Bridge 36 and even meaner to turn down a night mooring at Bridge 24. Additionally, I like remote moorings and must admit the idea of being triple moored doesn’t really do it for me. It is the same reaction I have to the concept of package holidays, bus trips and participation in team sports – I realise I am painting a grimly anti-social picture! The gates at Crick open at 10am, so of course I was all parked up by 8.30am – so ensuring front row of the parking, and not three fields away up a 90 degree slope (obsessive timekeeping has its benefits!). By 9am I was in the line, so I was one of the first 100 or so through the gates and the ‘proud’ recipient of yet another plastic mug. 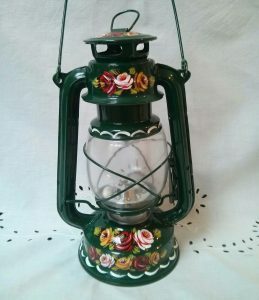 I must admit when I received one last year I couldn’t quite work out what it was – this was further hindered by the Lee sanitation advertising on the side, and I presumed with the weird handle that it was some sort of measuring device for ‘blue’ to go into the boat toilet. It was only after a conversation with a Crick volunteer that I learnt it was actually my very own beer mug. Next year I must remember to hand it back, too much plastic in the world and all that…. Much more to my taste was a one-off narrowboat being refitted. This particular boat was still a work in progress, and being lovingly lined with reclaimed old oak panelling taken from numerous sources. 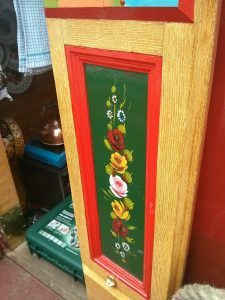 This narrowboat was also home to some lovely Arts and Crafts style wood-work and furniture. Much more up my street. 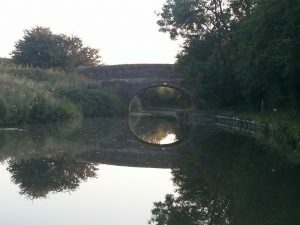 (I would provide a link to the boat-fitter, but having just gone through the Crick brochure I am beginning to wonder if I imagined the whole experience – or perhaps I had just wandered onto someone’s boat?!) Alongside the show-boats there are also a handful of old working boats, one maintained by the Dudley Canal Trust another nb Sculptor now moored at Stoke Bruerne canal museum and maintained by the friends of the museum. Alongside were nb Raymond and Nutfield, again maintained and funded by volunteers. This year my visit to these huge old boats was a chance to collect photographs of the canal art on the stern doors and inside the ‘back cabins’. 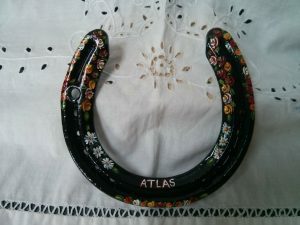 My plan is to collect photos of old artwork and build up a collection to refer back to as I paint pieces. 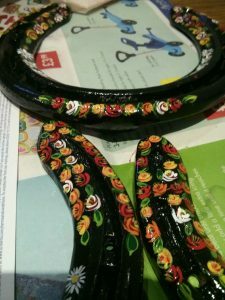 Although there are those who will argue there being a wrong and a right way to produce canal art I can’t help but feel it is is a constantly evolving form of folk art, which has continued to develop over two centuries. The challenge of Crick for a boat owner is not to spend any money. Last year I did quite well, just buying a hat for my chimney, this year was a catastrophic disaster, with credit-cards and cash flying. I did take River Canal Rescue (RCR) cover – after last year’s incident (perhaps more of this in a future post), I felt I should and as they had a show discount it seemed rude not to. Plus, despite the age of my Sabb engine they assured me parts would be found, made or reconditioned if something goes wrong. I also invested in two new fire-extinguishers. The horrific boat fires and deaths over the winter have rung alarm bells, especially as I realised my two extinguishers were dated 1996. The problem is there is no way to test whether they will work, all you have to go on is the pressure gauge so although both my current ones were in the green and had passed another safety certificate last year I was beginning to feel uneasy about their condition. For £30 it seemed worth buying new ones. By 4pm I was pretty much overdosed with the boat show, a bit like opening a box of chocolates and eating the entire selection in one sitting and then wondering why on earth you feel so violently sick! So, I meandered back to my car and onto Welford to move Pea Green ready for a couple more days trading under the trees near Welford lock. Again a thoroughly entertaining account . Laughed out loud , quite a feat when on your own ! I really must go to this event next time , hope I will be home then . Glad you had such a good day , cheers !